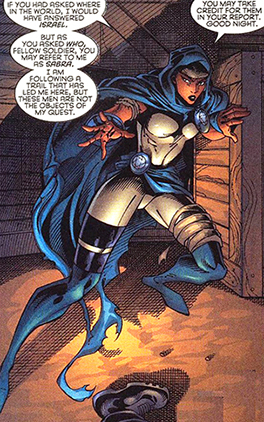 Powers/Abilities: Sabra possessed a variety of mutant powers that increased all of her abilities to superhuman levels. She could lift 50 tons, move at great speeds and had parahuman reflexes and endurance. She was durable enough to resist impacts from high caliber rifle fire and had been shown to recover from most injuries at three times the normal human rate. Sabra could share her life energy with others, using it to heal people's otherwise fatal injuries. She could also trigger permanent but random superhuman abilities in others, which put a considerable strain on her own powers. She could take back her life energy with a mere touch. Sabra wore bracelets that could fire paralyzing plasma-chafed energy quills. She could fly at speeds up to 300 miles per hour via miniaturized anti-gravity devices in her cloak. Sabra was a trained and highly skilled Mossad operative with access to and training in advanced weaponry. Sabra was a licensed (fighter) pilot capable of handling most conventional and military aircraft. Sabra was fluent in English, French, Hebrew and Arabic. Though highly professional, her experiences and background as an Israeli soldier tended to make Sabra act leery towards people of Arabic descent. At times, she had behaved suspicious or even downright hostile without any immediate cause. History: (X-Men II#67 (fb) - BTS) - Israeli mutant Ruth Bat-Seraph decided to dedicate her life to fighting crime and protecting the innocent after her son Jacob was killed during a terrorist bombing. (Incredible Hulk II#256 (fb) - BTS) - After becoming Sabra, Ruth decided to start working as a policewoman in the harbor city of Tel Aviv. (Marvel Super-Heroes III#6/4 (fb) - During her early years, Sabra encountered a drug-addicted woman dying in an alley. She decided to save her by sharing her life force. Not only did this cure the woman, it also gave her superpowers. The woman, calling herself Windstorm, joined the Israeli military. (Astonishing Tales II#6/3 (fb)) - Sabra sometimes liked accompanying her dad, a fighter pilot, and his squadron, keeping up with them under her own power. Through them, she met Ronit, daughter of one of her father's colleagues. The two would turn out to be fast friends even though Sabra's work kept them apart for long periods of time. (Incredible Hulk II#250) - While scanning the Earth for Bruce Banner, the Silver Surfer's cosmic senses picked up numerous superhumans across the globe, including Sabra. (Incredible Hulk II#256 - BTS) - The Hulk arrived in Tel Aviv after hiding aboard the freighter Star of David. As soon as he was spotted by the authorities, policewoman Ruth Ben-Sera was called in. She decided this was a job for Sabra. (Incredible Hulk II#256) - Hiding behind a cargo bale while she tried to change into Sabra, Ben-Sera was knocked unconscious when the Hulk toppled them, unaware she was even there. Later, Sabra, alerted by the explosions caused by a terrorist group attacking Tel Aviv, showed up and mistakingly believed Hulk and the terrorists were working together. She then attempted to incapacitate him using her paralyzing sting. Initially, the energy quills were succesful in draining Hulk's strength but seeing the dead child Sahad, whom Hulk had recently befriended, laying among the rubble fueled his rage, allowing him to overcome the paralysis. 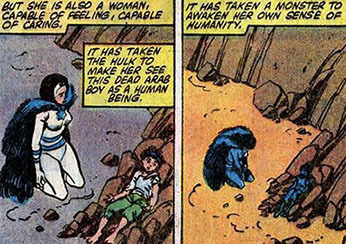 After dealing with both the terrorists and Sabra, Hulk took the corpse of his young friend away to the mountains for burial, unaware Sabra was following him. She carefully approached him to charge the Hulk with complicity. However, Hulk, crying tears of rage and grief, explained to her that he didn't kill the child and wasn't working with any terrorists. The befuddled behemoth continued to rage against the fact his friend Sahad had to die because of holy books he hadn't even read before jumping away. Initially ready to pursue him, Sabra let him go as she spotted the corpse of Sahad. Dropping on her knees next to the lifeless husk, she was overcome with emotion and realized it had taken a monster to awaken the humanity in her. (Contest Of Champions I#1) - Sabra was among the dozens of international heroes kidnapped by the Grandmaster and the mysterious Unknown (actually Mistress Death in disguise) and assembled inside a massive arena they created in Earth's orbit. She listened as the Grandmaster explained the rules of the game that they were being forced to participate in. The Grandmaster longed to restore his fellow Elder of the Universe, the Collector, to life. The Unknown would grant that wish if the Grandmaster's twelve selected champions were able to beat hers. Sabra was picked to be part of the Unknown's group and was teleported away. (Contest Of Champions I#2) - Sabra found herself paired with Iron Man and the Arabian Knight in an old ghost town somewhere in the American West. After introducing themselves, tensions quickly flared between Sabra and the Arabian Knight, who refused to work with a Jewess and flew off on his carpet to locate the artifact they were supposed to beat their opponents to. Going off solo as well, Sabra was suddenly jumped by She-Hulk, who figured the Israeli would be an easy target. However, Sabra stunned She-Hulk with her energy quills, evening the playing field while their aerial fight continued. Near Sabra, the Arabian Knight was fighting Captain Britain, using his scimitar to combat Britain's Star Scepter. When She-Hulk recovered from the effects of Sabra's quills, she knocked the Israeli for a loop, causing her to fall to the ground. Not wanting his ally to die, the Knight ordered his carpet to save her. Sabra, in turn, helped the Arabian Knight get rid of Captain Britain by cleverly deducing his scepter was the source of his power and taking the staff away. Eventually Iron Man located the artifactafter defeating Defensor and She-Hulk, winning that round for the Unknown. (Contest Of Champions I#3) - After the individual matches had been played, Sabra and all of the other champions returned to the arena simultaneously. Seeing as the Grandmaster's team had won, the Unknown was obligated to restore the Collector back to life. Sabra and her fellow heroes were stunned to learn the Unknown was actually Mistress Death herself. She honored En Dwi Gast's wish but tricked him by using his own life force to restore his fellow Elder. Mistress Death then sent Sabra and the other heroes back home. (X-Men II#67/Excalibur I#120 (fb) - BTS) - At some unrevealed point, possibly after encountering her during the so called "Contest of Champions," Charles Xavier contacted Sabra and invited her to join his Mutant Underground, providing her with access codes to secure communication channels should she ever need to reach him. (Incredible Hulk II#279) - Along with a delegation of other international superheroes, Sabra attended the festivities celebrating the Hulk's full presidential pardon. She was part of the parade and joined the other heroes on stage to pay tribute to the Hulk, recounting how he'd taught her about humanity when they fought. (Marvel Super-Heroes III#6/4) - Sabra was forced to confront Windstorm and the other members of a terrorist group called Israelis for Anarchy when they took over a kibbutz and held the American ambassador's deaf son hostage. The mentally unbalanced former addict was convinced she would kill Sabra today, seeing as Sabra's powers could not affect her. Sabra easily took out Windstorm's allies and attempted to rescued the ambassador's son. However, Windstorm used her air blasts to bring a wall down on top of the boy. Furious, Sabra tossed Windstorm as far away as possible while she tried to save the child. Windstorm soon returned to continue the fight but by then, Sabra was fed up and took her powers away from her (see comments). (Incredible Hulk II#386-387) - In Israel, the Hulk and Rick Jones, having been sent by the Pantheon's Agamemnon to find supposed future dictator Max Meer and bring him to the Pantheon's Mount headquarters, happened upon the Pantheon's Achilles, who had lived through the holocaust as a boy, chasing Meer and his friend Gretta Rabin through the streets. The Hulk chased after Achilles but was stopped by the arriving Sabra, who assumed he was the one trying to kill Meer. Rick Jones attacked Achilles, trying to prevent him from harming Max. Moments after that, they were forced to flee from an angry, mind controlled mob(courtesy of Gretta's mutant mind control powers, unbeknownst to anyone). After a ferocious fight, the then-intelligent Hulk was able to convince Sabra he was not the enemy. Hearing him out, Sabra decided to join the Hulk in his attempt to save Max. Ultimately, though they were able to prevent Achilles from killing Max, the child did get accidentally trampled by Gretta's mind controlled mob and wound up in a coma. (Excalibur I#121 (fb) - BTS) - After returning to Earth following an extended stay with the Shi'ar, Professor Charles Xavier reviewed the tactical situations of the various teams his former students were part of. Xavier figured the somewhat loosely knit Excalibur might benefit from Sabra's military expertise and urged Ruth Bath-Seraph to join the team on numerous occasions. Sabra declined, prefering to remain a member of the Mutant Underground. She did, however, begin to take a special interest in Excalibur using her connections within the intelligence community to find out all she could about the various members and their personal lives. (New Warriors I#58 (fb) - BTS) - At some point, Sabra met the Syrian hero Batal. (New Warriors I#58) - Sabra accompanied Israeli Prime Minister Yitzhak Rabin to New York City for peace talks between Israel and Syria at the United Nations. However, en route they were attacked by a group of unidentified super-terrorists. Sabra, with the help of the New Warriors, fought them off. Arriving at the peace talks with the Warriors escorting them, Sabra recognized the Syrian hero Batal. Sabra and Batal traded several hostile barbs but considered themselves professional enough not to fight. However, an unknown force suddenly took over Sabra's mind, forcing her to attack the unsuspecting Batal. She crippled him by savagely punching him in the neck and then tried to assassinate the peace talk delegates. (New Warriors I#59) - Through a supreme effort on their part, the New Warriors were at last able to stop Sabra. Justice managed to break Sabra's conditioning by reciting the Mourners Kaddish, a traditional prayer spoken to honor the dead. The wounded Batal was rushed to the hospital with a broken neck but without any apparent nerve damage, he was expected to make a full recovery. Sabra was taken back to Israel in chains, having agreed to cooperate with an investigation to find out if indeed she had no control over actions (see comments). (New Warriors I#66 - BTS) - Her personal encounter with Justice had left Sabra confused about her feelings towards the leader of the New Warriors. (New Warriors I#66) - Deciding to take a chance, Sabra called the New Warriors' Crash Pad and, as luck would have it, found that Justice was on monitor duty. She revealed that she'd been thinking about him a lot lately and asked if he wanted to meet. Recently broken up with Firestar, Justice was unsure how to proceed (see comments). (X-Men II#67) - Sabra grew worried about the X-Men's fate after Bastion launched Operation: Zero Tolerance, an anti-mutant campaign supported by the government and working in close concert with the Mossad. Deciding to help Xavier's students by handing them a copy of all the classified intelligence the Mossad had on Bastion and his possible weaknesses, Sabra finished downloading the info right on time for two guards to show up and demand she accompany them to her chief. Quickly pocketing the disc with the information, Sabra went along with what she thought were her colleagues. However, as soon as they entered the car, the two guards shifted into Prime Sentinels, ready to kill her for belonging to an underground network of mutant sympathizers. Relying on her superior strength, agility and reflexes, Sabra managed to cause the car to crash. Aware a simple car accident wouldn't be enough to stop the Prime Sentinels, she quickly made herself scarce, now even more determined to aid the X-Men. (X-Men II#68 - BTS) - Sabra managed to stow away on a freight ship bound for New York City, escaping the country without being tracked by either the authorities or the Prime Sentinels. (X-Men II#68) - Sabra arrived in New York City in time to save a Lower East Side harbor cop's life who ran into two thieves unloading crates. Sabra quickly paralyzed them with her energy quills, allowing him to take full credit for capturing the crooks in his report. (X-Men II#69 (fb)) - Sabra tracked down Iceman, who was being hunted by the Prime Sentinels along with his recent allies Marrow and Doctor Cecilia Reyes. Unable to fight an entire battalion, she caused part of a building to fall and crush them, with the mutants protected by both Iceman's hastily-erected ice sheath and Cecilia Reyes' bioplasmic forcefield. After the dust had settled, Sabra announced she had information on Bastion's weaknesses and that she would lead them to act on it. Iceman, a little miffed that he was overruled by the new arrival, decided to follow her anyway. Having nowhere else to turn, Cecilia and Marrow figured they'd best tag along. (X-Men II#69) - Riding on Iceman's ice ramps to a destination Sabra would not disclose, Cecilia got fed up and demanded to know what she was really up to. Backed by Marrow, Reyes pointed out that it was hard to believe Israel would assign one of its top super agents to operate so cavalierly on US soil. Annoyed, and holding the agressive Marrow down in a choke hold, Sabra told of her son Jacob and how losing him motivated her. Just then, Marrow spotted a Prime Sentinel tracking them but she killed it with one of her bone daggers before it could attack. Not too long after the incident, Sabra and the others arrived at a Conneticut beach house, where they found the one thing Bastion cared for in the world: the woman who cared for him after he returned to Earth following his judgment by the Siege Perilous. They also found Bastion and a small army of Prime Sentinels. Sabra watched as Iceman took on Bastion, keeping him engaged in conversation until SHIELD (acting under orders from the government, led by Robert Kelly) arrived to shut Operation: Zero Tolerance down. Afterwards, Sabra cared for the kidnapped son of Detective Charlotte Jones, who was being kept at Bastion's caregiver's house as well. (X-Men II#72 - BTS) - Using advanced Mossad technologies, Sabra learned that Magneto's name of Eric Magnus Lensherr was actually a fake identity created by the Romanian master forger Georg Odekirk, whose handiwork had only now been uncovered. (X-Men II#72) - Sabra visited the home of Gabrielle Haller to inform her of her findings. Shocked, Haller agreed with Sabra that the information deserved top priority. They left together to reach Odekirk and question him about Magneto's true identity before the master of magnetism had a chance to silence him. However, by the time they reached Odekirk's home in Sinou, Romania, they found Magneto had already killed him. (X-Men II#73 - BTS) - Determined to find Magneto and bring him to justice, Sabra decided to infiltrate the Xavier Institute to find out how Joseph, who claimed to be the real but mysteriously deaged master of magnetism, fit into their recent findings. (X-Men II#73) - Sabra ambushed Joseph in the woods as he was having a conversation with Maggott. Shooting him in the back with her paralyzing quills, she was ready to fly off with her stunned prisoner. Maggott, though no match for her, managed to keep her distracted enough to reveal her true purpose with Joseph. Surprised, Maggott told her there was no way Joseph was Magneto. After reviving, Joseph initially had considerable difficulty believing he really wasn't the actual, deaged Magnus. Eventually latching on to the idea but torn by the question of his true origins, he asked to accompany Sabra if she could help him get some answers. She agreed to his proposal, insisting they departed immediately while leaving behind a rather confused Maggott. (Excalibur I#121 (fb) - BTS) - Several months after his supposed death in the Negev desert, Legion's trademark psionic, telekinetic and pyrokinetic energy signatures were picked up by the Mossad at various locations. Left with a mystery but afraid it might mean the extremely powerful, mentally unstable mutant was back, the Mossad called in Sabra, who was also unsure how to proceed. (Excalibur I#120) - Acting without the orders of her superiors in the Mossad, Sabra decided to contact the X-Men via Xavier's Mutant Underground. However, because the Xavier Institute had been stripped bare by Bastion during Operation Zero Tolerance, her transmission was automatically relayed to Muir Island, where Nightcrawler and Colossus answered. Recognizing Sabra from the Contest of Champions they had both attended, Colossus asked what they could do for her. As soon as Sabra mentioned the involvement of Legion, Nightcrawler immediately promised to come help out. He promised Sabra the team would come and help out immediately. (Excalibur I#121 (fb)) - Sabra greeted Nightcrawler and the other Excalibur members with a certain reservation, listing all their personal flaws and quirks as she met them. For instance, she called Meggan flighty and unstable while commenting on Shadowcat's love life, in particular her recent breakup with Pete Wisdom. She further aggravated Kurt when she revealed that Professor Xavier had repeatedly ask her to join Excalibur to provide guidance and leadership. Deciding the empathic Meggan could act as a compass to find Legion, she guided the team to the heart of Jerusalem, where they learned it wasn't Legion but actually his three split personas Cyndi, Jack Wayne and Jemail Karami causing trouble and destroying the holy city. Brash and angered by the destruction of so many religious relics, Sabras confronted Jack Wayne, who easily knocked her for a loop with a telekinetically thrown piece of debris to the head. He was ready to kill her by dropping a massive rock on her but Shadowcat saved the dazed and thoroughly humbled Mossad agent. The team learned from Jemail that, following Legion's apparent demise, they were destined to vanish as well. While Karami was willing to pass on, Jack and Cyndi were still clinging on and causing mayhem. Eventually, thanks to Meggan's assistance, Jemail was able to convince the two to join him beyond the veil. With the threat passed, Sabra thanked Excalibur for their help and handed Nightcrawler a disc she claimed would help them locate Professor Xavier, who was still missing following Zero Tolerance. (Excalibur I#121) - With the mission against Legion at an end, Sabra had to face a Mossad board of inquiry over her disobeying orders. After recounting the facts to General Tal and the other board members, they asked her if Excalibur would be open to work with them in the future. Sabra confirmed. (Uncanny X-Men I#366) - Sabra was at Joseph's side in a top secret Mossad military bunker ten miles south of Beersheva when Mossad scientist Doctor Hamal revealed the magnetic mutant's origins. He was, with 100 percent certainty, a clone of Magneto. A little later, she spotted Joseph walking off into the desert. He declined her offer to keep him company and was kidnapped by Astra not too long after. (Uncanny X-Men I#368) - Sabra travelled to the Xavier Institute to attend the funeral services for Joseph. (Uncanny X-Men I#379) - Sabra was one of the millions of mutants who temporarily lost their powers when the High Evolutionary decided to switch off the mutant gene. (X-Men II#111) - With the Legacy Virus cured, Genosha's ruler Magneto girded his army for war. In response, Israel increased its security measures, a task monitored by Sabra, who was interviewed for a news report. She stated it had become clear to her that Magneto has become the monster he claimed to despise. She went on to say that this rumored son of Israel had brought much shame to his countrymen and that she felt he needed to be dealt with once and for all. (Avengers/JLA I#4) - When a scientist from a distant cosmos began to merge Earth-616 with his own home universe, time and space began to tear itself apart, causing waves of mass destruction. Affected by the time-space disruptions, Sabra did her best to protect the Wailing Wall in Jerusalem from the destructive waves. (New X-Men I#131 - BTS) - Sabra joined the X-Corporation at the request of Professor Xavier. (New X-Men I#131) - At Paris' famed Pere la Chaise Cemetary, Sabra attended the funeral of her fellow X-Corporation member Darkstar, who had died fighting Weapon XII in the Paris subway. 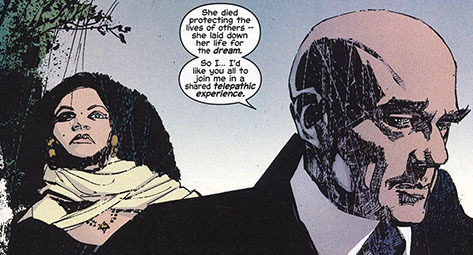 Professor Xavier led the service and allowed Sabra and the others to taste the life of Laynia Petrovna. (X-Treme X-Men I#24) - As Sabra and the other X-Men and X-Corporation members were honoring Darkstar at Pere la Chaise, they were observed by Cannonball (Sam Guthrie), who had decided to quit the X-Men in light of recent events. (New X-Men I#132) - Sabra visited Genosha with Quicksilver and Thunderbird (Neil Shaara). Feeling awkward and ill at ease amidst the devastation caused by Cassandra Nova's Mega Sentinels, Sabra helped rescue a frantic Unus the Untouchable, who claimed he'd been attacked by ghosts. Joined by Storm, Charles Xavier and Jean Grey, Sabra and the others eventually discovered the ghosts were the voices of the dying Genoshans that Magneto had recorded on a "black box," designed as a lasting memorial to their lives. The black box was in the hands of Polaris, driven to the brink of insanity because of the many millions of voices buzzing around her. 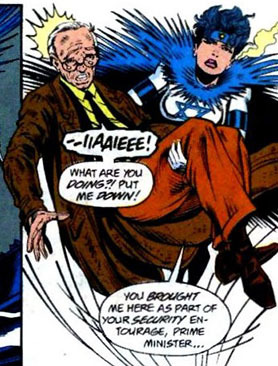 When Xavier and Jean used their psi-abilities to stabilize her, Polaris managed to get the recorder to play. Sabra and her fellow mutants heard the voice of Magneto, speaking for the Genoshan nation, as the legacy of a massacred people shot into the stars. (Secret War#1 - BTS) - Sabra shut down a terrorist cell that was planning a nerve gas attack in the Gaza Strip. Report of her action reached SHIELD headquarters. (Excalibur III#5 -BTS) - Sabra was stationed at the X-Corporation offices in Mumbai, India (along with Thunderbird, Lifeguard and M) when Stripmine and his trolls gained access to the building. They planted a bomb on the Cerebra unit powerful enough to take out the entire headquarters. Lifeguard sensed the threat but was too late to stop it. (Excalibur III#5) - As the bomb went off, trapping and wounding all of those inside, Charles Xavier became aware of the event in Genosha. Visiting Mumbai in his astral form, he checked in with Sabra, who was hard at work coordinating the rescue effort. Sabra noted it was a miracle the casualties were minimal. (House of M I#8 - BTS) - In the wake of M-Day and the Scarlet Witch's reality warp erasing the mutant gene on a global scale, Sabra was among the two hundred mutants who retained their powers. (Astonishing Tales II#6 (fb)) - Hydra launched an attack on Jerusalem, sending in a massive robotic construct in the first wave. Sabra was tasked to deal with the robot while the Israeli military (including Sabra's father who was piloting a combat helicopter) engaged the ground forces. The robot proved to be a mere distraction so that Hydra could capture Sabra for experimentation. Shot in the back with a gene inhibitor ray that blocked her powers, she was taken to a Hydra lab where she was chained up. As she managed to free herself with heroic effort, Israeli forces located the Hydra base and attacked hoping to rescue Sabra. During the fight, Sabra's father sacrificed himself to save his daughter by crashing his combat copter into the base, taking out their main guns. At that moment, Sabra remembered an old lesson about entering the military. When you enter, you get two families, your own and your fellow soldiers (see comments). (X-Men: The 198 Files) - General Demetrius Lazer made an assessment of all known gene active mutants based on their potential threat level. In a report filed to Colonel Reyes and Doctor Valerie Cooper, he deemed Sabra to be a high threat. (Civil War: X-Men I#1/Civil War: X-Men I#2 (fb) - BTS) - After several mutant internees known as the 198 escaped from the Xavier Institute, Bishop was tasked by O*N*E directors Val Cooper and General Lazer to find them. 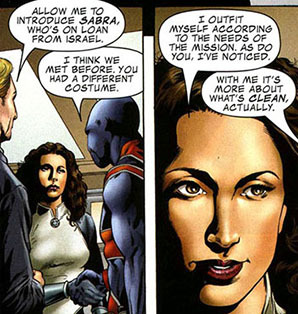 Bishop recruited Sabra and the British size-changing hero Micromax to help him, with Sabra on loan from the Mossad as a sign of support for the principle of superhero registration. (Civil War: X-Men I#2) - Sabra joined her teammates at O*N*E's Sentinel Base in New Mexico and watched as a Sentinel recently damaged by the X-Men underwent repairs. Informed that the 198 were hiding in a bunker in the Nevada desert filled with remote controlled WMDs, Micromax, Bishop, Sabra, and O*N*E's Sentinels raced to the location, only to find Cyclops and the X-Men had gotten there already. For a while, it seemed like the incident would be settled peacefully until the mind- controlling Johnny Dee, who himself was being controlled by General Lazer, also in charge of the WMDs, took over Cyclops and forced him to blast Bishop. (Civil War: X-Men I#3) - Sabra ordered Micromax to attack the other X-Men, amazed that the unconventional British hero first put on some appropriate music for the battle. As she did her best to take down Archangel, Micromax and the O*N*E Sentinels tore into the X-Men and Shatterstar. In the end, Micromax grabbed Archangel and disposed of him. He then turned his attention to Shatterstar, who didn't think twice about stabbing the giant in the gut. Micromax collapsed, reverting to his normal size, with Sabra calling Shatterstar a murdering animal. He shot back this wasn't murder but war. (Civil War: X-Men I#3) - Sabra called attention to the seriousness of Micromax's injuries but Bishop revealed that Lazer's last act while pulling the strings of Johnny Dee was putting the bunker on lockdown via remote control while activating the self destruct on the WMDs. With no way out for the mutants who'd escaped Xavier's and sought refuse inside, Bishop dryly stated they were about to lose half of Earth's remaining mutants. (Civil War: X-Men I#4) - While Bishop desperately tried to blast open the bunker doors, Sabra took care of the critically injured Micromax. She was surprised to see that the broad shouldered, physically fit hero turned into a potbellied shadow of his former self. When she commented on this, Micromax revealed he was a shapeshifter. Trying to keep his spirits up, Sabra joked he must have been extra relieved not to get depowered on M-Day because of that. With Micromax slipping away fast, Sabra watched how Archangel convinced the paramedic treating Micromax to inject the British hero with some of his healing blood. This stabilized him enough to be transported. Sabra and the others then watched as Cyclops and Bishop combined their powers to try and break the door open. They were joined by the newly arrived Ms. Marvel and Iron Man, who joined in the effort and even got the O*N*E Sentinels to participate. This proved sufficient to breach the bunker, which allowed the 198 to escape just before the WMDs went off. (Civil War I#6) - After the mission with O*N*E, Sabra joined Iron Man's pro-registration forces to help fight off Captain America's band of rebels, who planned to invade the Initiative's Negative Zone prisons and free their captured friends. (Union Jack II#1 (fb) - BTS) - After the British covert intelligence agency MI:5 learned that the terrorist faction RAID was about to stage several major strikes, in London in part to prove themselves major players, other countries responded by sending super powered operatives. 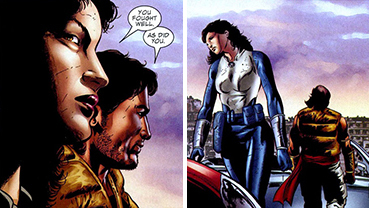 The Mossad assigned Sabra while SHIELD sent Contessa Valentina Allegra de la Fontaine (secretly a Skrull infiltrator) and the Saudi Arabian authorities dispatched their latest Arabian Knight (Navid Hashim). The makeshift team waited around at MI:5 headquarters for their team leader Union Jack (Joey Chapman) to arrive. MI:5 Director Gavin kept them company. (Union Jack II#1) - As soon as Union Jack arrived, the team went to business despite rising tensions between Sabra and the Saudi national hero, Arabian Knight. With less than 8 hours to go to prevent multiple strikes and with no clue where RAID's army of super powered mercenaries were going to strike, Union Jack and his forces looked up Batroc to get the necessary information out of him. Unwilling to betray the trust of his peers, Batroc escaped Sabra and the others though not without conveniently "forgetting" his cellphone with Zaran the Weapons Master's number clearly displayed. Dialing the number, Sabra was asked to keep Zaran talking while MI:5 tried to triangulate his location. Pretending to be a call girl recommended by Batroc, Sabra did her best to persuade Zaran but he hung up, suspecting something was off. Valentina snickeringly commented Sabra sounded as inviting as dental surgery. Annoyed, Ruth shot back that her country trained its women to act like soldiers not whores. Unaware what he was getting into, the Arabian Knight told Sabra she might want to consider embracing the sacred role of wife and mother the way Allah intended. Furious, Sabra lept for the Knight's throat while telling him she lost her son when Palestinians ambushed a bus full of school children that her son was among. The fight was broken up when MI:5 techs managed to get a fix on Zaran's location, who happened to be nearby. The team raced to stop Zaran, Machete and a number of armed RAID gunmen with Sabra blasting Machete after he'd hit Arabian Knight with one of his throwing knives. When she went to check on him, Sabra was amazed to find Hashim was only slighty grazed. He explained that his uniform was made from the mystical fabric of the original Arabian Knight's flying carpet, thus allowing him a measure of invulnerability. The Knight then tried to apologize for his earlier comment but Sabra told him to forget it since they were allies at the moment, adding that on another day she'd have shoved the machete through him herself. In the end, Union Jack's team defeated Zaran, Machete and the RAID forces, only to be reminded by MI:5 Director Gavin that it was just a distraction, allowing the other attacks to commence. (Union Jack II#2) - Sabra fought Crossfire and the Death-Throws on Tower Bridge, taking out Tenpin and moving fast enough to dodge even the accurate riflefire of Crossfire, who tried to hit the bulletproof Mossad agent in the eye but only wound up grazing her. 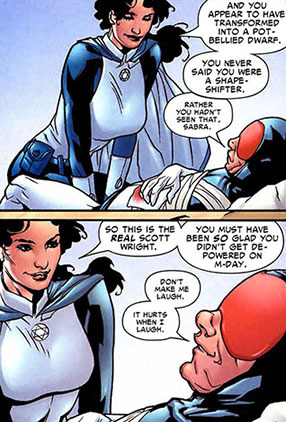 Union Jack helped Sabra defeat her enemies by driving one of SHIELD's Flying Cars into the band of villains, relying on Sabra to catch him as he fell. Bombshell being the only member of the group still standing, she willingly surrendered her bag of explosives. Sabra and Union Jack then rushed to London's Heathrow Airport, where the Arabian Knight and Valentina de la Fontaine were fighting Firebrand and Boomerang while RAID agents tried to launch planes they intended to crash on the city. Sabra and Union Jack slammed into the cockpit of the one jet liner that had managed to take off. Though she was a trained pilot, Sabra let Jack handle the landing, preferring to use her super strength to try to stabilize the craft. Thanks to Sabra's help, Union Jack prevented the plane from causing any excessive damage. However, as soon as he emerged from the cockpit, he saw that the Corruptor (Jackson Day) was on the scene, having already mentally enslaved Sabra and the others, demanding that they first destroyed Union Jack and then all of London. (Union Jack II#3) - Union Jack cleverly dodged the attacks of his now mind-controlled teammates, making sure they hit the Corruptor instead. Though the Corruptor was down for the count, Sabra and the others were still after him. Contacting MI:5 Director Gavin while trying to stay a step ahead of his assailants, Union Jack learned that the Corruptor's control effects lingered, making his targets susceptible to suggestions that matched their own preconceived notions. In this case, Union Jack managed to turn Sabra and the Arabian Knight against each other by suggesting to the Israeli that the Knight considered her to be a stupid cow. Furious beyond belief, Sabra hacked into the Knight while Union Jack knocked out the Contessa. After she'd dealt with her Saudi ally, Sabra came after Union Jack again but he had figured out the invulnerable Israeli's one weakness: her need to breathe. Forcing her to inhale one of his sleep gas pellets, Chapman succeeded in knocking her out. Union Jack took his injured team to the MI:5 medical facilities but was soon forced to rely on them once again when Ecstasy, a Darkforce-wielding RAID agent, invaded the premises. Sabra and the Arabian Knight were too weak to deal with her though the Knight's enchanted blade eventually proved to be Esctasy's downfall. When they questioned her, Ecstasy revealed RAID's WMD-style weapon: an advanced model Dreadnought killer robot that they'd smuggled into the country. Despite Sabra's protests and figuring he physically wasn't up to it yet, Arabian Knight joined her and the others. As they flew over London in their SHIELD Flying Car, they spotted the gigantic Dreadnought tearing down Trafalgar Square. (Union Jack II#4) - The Dreadnought destroyed the Flying Car by launching the tip of its finger through the hood. Sabra bravely declared she'd face the robot alone while Union Jack tried to land the wrecked vehicle, ignoring Chapman's warnings and getting covered in paralyzing liquid nitrogen. Union Jack ordered Contessa to melt Sabra an airway using the standard issue SHIELD laser torches while he and the Knight faced the iron giant. Using his enchanted scimitar, the Knight managed to pierce the Dreadnought's armored foot, before he was blasted away. Hitting a wall while already dealing with a concussion from the previous battle, he was down for the count. Sabra however, rejoined the fray after escaping her nitrogen prison. She attempted to tear open the cut made by the Knight, only for the Dreadnought to hit her with a blast so potent that she was sent flying for miles. By the time she returned, she found Union Jack and Contessa had downed the Dreadnought using a combination of luck, expert timing and an explosive nicked from Bombshell. With RAID's threat ended, Sabra soon took her leave of Chapman and the others, begrudgingly complimenting the Arabian Knight on his good work. Hashim returned the compliment though the two former allies went their separate ways again. (Astonishing Tales II#6/3) - The Israeli government threw a banquet for Sabra, wishing to honor their greatest soldier. The event was attended by her mother, brother and several other relatives and close friends as well as press and dignitaries. Sabra hated to be there, feeling she was being put on display. Her mother assured Ruth it would be fine, pointing to her brother, who was having a great time. Just as Mrs. Bat-Seraph went to get some more food, Ruth was approached by her old friend Ronit and her teenage daughter Yael. Surprised to see Yael all grown up, Sabra happily took some time to catch up with the soon-to-be 18-year old girl. Realizing Yael would soon have to report for Israel's mandatory two-year military service, Sabra offered advice to the frightened girl, assuring her that being nervous as a soldier was quite common. She even recounted the mission against Hydra to show that, even with powers, one can experience nervousness. Yael eventually revealed she'd been accepted into the Air Force's Flight Academy, which should have been a dream come true because she had always wanted to fly, but she was still unsure. In the end, Sabra helped her decide on the less dangerous but no less crucial military intelligence route. To help make Yael's dream come true, Sabra picked up the girl and took her for a ride in the sky. (Heroic Age: Heroes) - After taking over as head of the Initiative, Steve Rogers compiled research on and reviewed all of the available and potential recruits. Commenting on Sabra, he noted her strong, proud personality. The former Captain America also found her motivation and work ethic to be commendable, noting she was a valued ally in the Middle East. He finished his review by suggesting the Initiative should try and maintain their then-current excellent working relationship for the benefit of any future missions in that region. As a bonus, he listed her pros and cons. The pros being extensive training in covert operations, combat, and intelligence gathering. Her being under the jurisdiction of a foreign government was considered a definite con. (Amazing Spider-Man II#685) - Hoping to stop the planetary web of satellites implemented by a supposedly dying Doctor Octopus before it went active, Spider-Man reached out to international heroes like Union Jack, Big Hero 6 and Sabra to destroy the plants nearest to them. Sabra broke into an Isreali satellite factory to find herself besieged by Octobots, robotic critters designed by Dr. Octopus and equipped with mind control technology. She was able to outwit them, blasting the robots as she made her way through the factory. 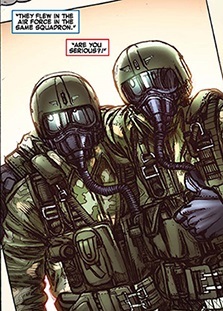 (Amazing Spider-Man: Ends of the Earth I#1) - Unbeknownst to Sabra, the mercenary Crossbones was hired to protect the Jerusalem facility she was trying to destroy. After defeating the Octobots, Sabra contacted Spider-Man to inform him that the Jerusalem site was secure, igoring Spidey's warnings that Octopus would never leave a base without proper protection. 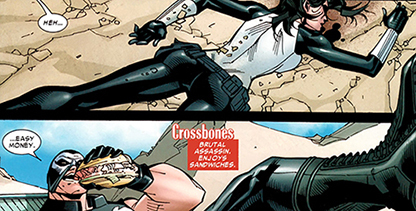 As she approached the missile carrying the satellite, ready to destroy it, she was shot in the head by Crossbones, who had been waiting with a sniper rifle in hand to pick her off. Enjoying his sandwich as he pulled the trigger, he commented to himself this job was easy money. (X-Men III#31 - BTS) - The overly confident Crossbones had left Sabra for dead, not bothering to check if she'd actually died. As it turns out, the bullet had only grazed her. Sabra resumed her work with the Mossad, striking up a romance with a physician working out of the Mossad's Paris airport facilities. (X-Men III#31) - Sabra welcomed Storm and a team of her X-Men, who were in dire need of her help after fighting off an alleged monster in the North Sea. Not asking any questions, Sabra supplied Storm and her team with food, a safe place and even made sure their aircraft was refueled and ready for take off. However, she did make it clear to Domino that the doctor who was checking on Colossus was quite unavailable moments after the blushing physician agreed to meet her at the safe house later. (X-Men III#34) - Sabra used the intelligence sources of both Interpol and the Mossad to track down where a stolen sample of proto-mutant DNA had wound up. Confirming it was now in the hands of a cult known as the Heavenly Path, operating in Punta Arenas, Patagonia, she relayed the information to Ororo and her X-Men via satellite phone. (X-Men III#35) - After the X-Men managed to retrieve the sample of proto-mutant DNA, Storm contacted Sabra and told her to expand the search for any signs of proto-mutants that she'd put out earlier to include all possible parameters. Aware of the immensity of such a search, Sabra asked to at least describe what on Earth that Storm was looking for. The wind rider replied that itself remained unclear. (X-Men III#36 - BTS) - Storm's search led Sabra to learn of Gabriel Shepherd, a suspected live proto-mutant. Tracking his whereabouts, Sabra decided to approach him herself when he took a flight leaving out of JFK International Airport in New York. She infiltrated the local TSA agency while the X-Men were nearby waiting. (X-Men III#36) - Eyeing the airport's security cameras, Sabra spotted Shepherd. Trowing her weight around as a member of the Mossad, she got the TSA to cooperate, ordering them to delay his flight with a made up reason until she had a chance to contact him. The powerful Shepherd was already aware Sabra was after him and contacted her himself. She took him to meet the X-Men, who were amazed to see one of their 700 year old progenitors. After reviewing the files Sabra delivered Storm on Shepherd, which didn't contain anything noteworthy, Storm ordered the intelligence agent to dig deeper as someone who'd been around for 700 years was bound to have done something noteworthy. Leaving the perplexed Sabra, the X-Men flew Shepherd to Chicago in their jet. (X-Men III#37) - Joining the X-Men after they landed in Ontario, Sabra tried to console Psylocke, who was getting worried about the disappearance of the teleporting young Pixie, who had disappeared with Shepherd following a fight between Shepherd and Colossus. In the end, both Pixie and Shepherd were fine. (Uncanny Avengers I#16) - Sabra joined the other heroes of Earth in an attempt to prevent the Celestial Exitar from landing on Earth and passing a potentially catastrophic judgment. (X-Men IV#9) - Sabra responded to Storm's call for assistance during the Arkea crisis. Figuring the team could use some additional help, she asked Gabriel Shepherd to accompany her. She and Shepherd rendez-vous'ed with Storm and Psylocke at an undisclosed location. Initially, Sabra was a bit skeptical about Arkea, figuring that a malevolent alien infection that could take over an entire world seemed farfetched. She pointed out that the X-Men's sole source of information was the criminal John Sublime. Psylocke assured Sabra that Sublime's claims were legitimate. Storm then explained what she needed from Sabra: the meteorite that brought Arkea to Earth. The meteorite had been scattered around the globe and the X-Men were set to destroy all the fragments. In that mission, the X-Men were not going to be held back by bureaucracy or red tape. It was up to Sabra to prevent any international incidents. With a smirk, Sabra assured Storm that she could help prevent them from starting World War Three...but probably just barely. (X-Men IV#11) - Sabra learned from her sources that Madelyne Pryor, part of Arkea's team, had managed to acquire genetic material belonging to Selene Gallio. She contacted Storm and her team to inform them of this development, which led the X-Men to conclude Arkea was in the business of recruiting deceased super villains. (X-Men IV#16) - When the top assassin known as the Future kidnapped Jubilee, who had been acting as a surrogate mother for Future's son Togo, Storm got in touch with Sabra. The X-Men's leader planned a massive retaliatory strike and wanted to know all the intelligence that Sabra had on him. Bat-Seraph warned Storm that she should be careful and maybe call in the cavalry, seeing as the level of redaction on the files signified the man's importance. Undisturbed, Storm wondered who Sabra meant by "the cavalry," reminding her that they are the X-Men, an elite band of some of the most powerful beings to exist. All they needed was to know where to strike. Sabra sent Storm all the files available to her. Comments: Created by Bill Mantlo (writer) and Sal Buscema (pencils & inks). Sabra must have another superpower: changing the color of her eyes. Throughout the years, she's appeared with brown, blue and even green peepers. Like Markus Raymond quite correctly pointed out in the comments he wrote on Windstorm, it's a little weird that Sabra didn't remove Windstorm's powers a lot earlier...like, say, in the opening moments of the battle before the little guy you're there to rescue gets a wall dropped on top of him? But then again, that would have made for a really brief story, even for a backup strip! In the pages of Excalibur, Sabra was referred to by Israeli military commanders as "sochenet"... which literally translates to "female nurse." The flashback sequence in Astonishing Tales II#6 is a bit hard to place continuity-wise. 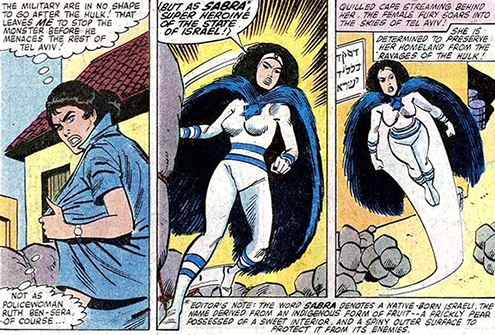 The copy states that Hydra attacked Jerusalem "years ago," yet Sabra is seen wearing a fairly recent costume. It could be an early prototype she just slipped on to rush out and deal with the emergency, or maybe Sabra's outfits vary depending on her mission. 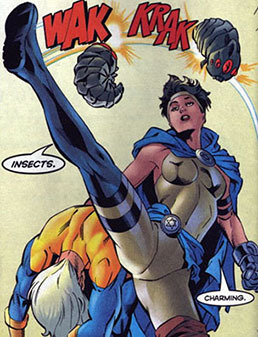 As for Sabra's appearances in New Warriors, no one ever commented on who was behind her mental conditioning. The teased romance between Sabra and Justice has remained a dangling plotline as well. As she so conveniently explained to her teammates and the readers in Contest of Champions, the codename Sabra refers to both a native of Israel and a prickly pear native to the region. Ruth's last name was originally "Ben-Sera" during her first active appearance but was later moved to Bat-Seraph, which is a corrected transcription of Hebrew. It's hard to comment on the mistrusting, hostile way Sabra acts around Arabs in general and muslims in particular without getting stuck in the political, sociological and religious quagmire that is the Israeli/Palestinian conflict...and that is not what this site is about. 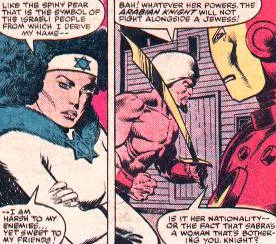 Let's just say the way she's been portrayed since Bill Mantlo created her in 1980 is still reflective of the situation in the Middle East today and, yes, that's a schande for all goyims. Sabra received profiles in Official Handbook of the Marvel Universe #9, Official Handbook of the Marvel Universe: Deluxe Edition#11, Official Handbook of the Marvel Universe: Master Edition #20, Marvel Encyclopedia HC Vol. 2: X-Men, X-Men: The 198 Files, All-New Official Handbook of the Marvel Universe A-Z#9, Civil War: Battle Damage Report and Official Handbook of the Marvel Universe A-Z HC Vol. 9. At an unrevealed point and with an unrevealed father, Ruth Bat-Seraph gave birth to a baby boy. 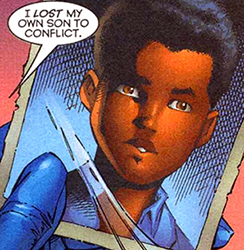 By all accounts raising the child alone, Bat-Seraph dedicated her life to the well being of her boy. However, even her superpowers couldn't protect her son at all times. Palestinian terrorists targetted the school bus Jacob was on, blowing up the vehicle and killing her only child. The loss of Jacob indirectly motivated Bat-Seraph to use her mutant abilities to defend her country, especially those too weak to defend themselves. Sabra's mother was well aware of her daughter's dual identity as one of Israel's most prominent super soldiers. She was proud of Ruth and all that she had accomplished for her country. Mrs. Bat-Seraph gladly attended a special party thrown by the government to honor her daughter's achievements. Enjoying the splendid spread of foods provided and ready to return for seconds, she reminded her daughter to enjoy herself, pointing at Ruth's brother, who was clearly having a good time. The always duty-obsessed Sabra explained to her mother that she didn't like being put on display. Having heard her daughter's complaints, Mrs. Bat-Seraph headed back to the buffet. Sabra's father was an experienced fighter pilot with the Israeli Air Force, also trained to fly combat helicopters. Back when his daughter first started using her powers as Sabra, he regularly enjoyed flying with Ruth as she accompanied his squadron either during training or on missions. When the terrorist organization HYDRA attacked Jerusalem with a giant robot and ground forces (secretly to capture Sabra, which they eventually managed to do), father and daughter fought together. After it became clear his daughter was captured and held hostage as a test subject for HYDRA in one of their nearby labs, Bat-Seraph was flying a combat helicopter as part of the military operation to rescue Sabra. Even though the Israeli heroine had managed to free herself, Bat-Seraph still wound up nobly sacrificing himself by crashing the helicopter into the enemy's primary defense guns.